If you haven't seen this set you really have to check it out (if you live in the UK I can send you a free copy of the mini catalogue, just email me with your details.) This little owl has lots of equally cute pals - the fox, a monkey, lion, giraffe, whale and a tortoise. These images aren't just for tots; my teenage daughter and my sons aged 9 and 11 1/2 all loved this card. By the way, the 'branches' the owl is standing on are the tree trunks from Trendy Trees. I love it when you can use something in a different way. My computer, which has been playing up big time all weekend, was taken to be diagnosed today. And guess what? It behaved beautifully when it was there! How does that happen? 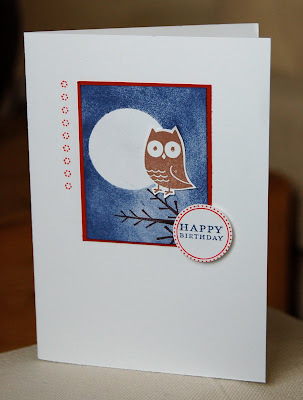 The expression on my face must've been very similar to the owl in my card today! Oh, this is so cute, Vicky! I have this set and may have to try this technique with the owl. So adorable!